Albizia (Albizia julibrissin): growing, planting, caring. A small tree with flowers looking like silky threads ! Albizia julibrissin - the Persian silk tree - is a species of small deciduous tree in the family Fabaceae, native to southwestern and eastern Asia, growing to 5–16 m (16–52 ft) tall, with a broad crown of level or arching branches. The bark is dark greenish grey in colour and striped vertically as it gets older, the leaves are bipinnate, and the white or pink flowers are produced throughout the summer in dense inflorescences. It is widely planted as an ornamental plant in parks and gardens, grown for its fine leaf texture, flowers and attractive horizontal canopy. There are two varieties: A. julibrissin var. julibrissin, the typical variety - considered as invasive in some locations - and A. julibrissin var. mollis. which differs in the shoots being densely hairy. 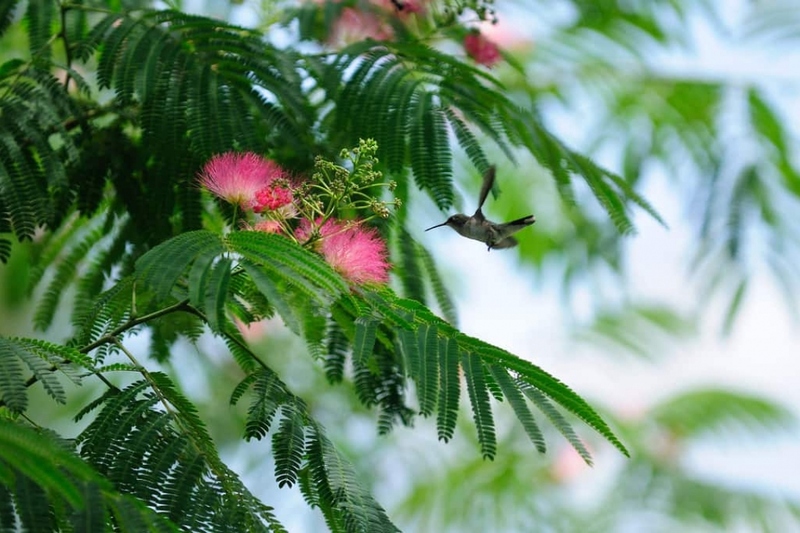 Plant your albizia away from the cold, in sandy, ordinary, neutral or limestone soil, in full sun, preferably in late autumn or winter, in unfrozen soil, during vegetative rest of the plant. Before planting, trim damaged roots, balance the root volume and the above ground volume. Plant in a hole that is at least two times bigger than the root ball, generously spraying the roots with water before planting: this will greatly improve the chances of the plant taking root, no matter the conditions. While digging the hole, separate the layers of dirt in two piles that you will put back in order. Drive a stake into the bottom of the hole to the side to provide protection from strong winds. Replace the earth starting with the bottom soil, place the tree and pay attention not to bury the root collar, which is just between the roots and the trunk. Fill the hole in and form a basin around the base, which will be used for watering the first months by tamping down the soil around the roots. Don't hesitate to use all of your body weight! Attach the trunk to the stake and water until the planting basin is full — at least two watering cans! The trimming of the albizias is minimalist: remove the dead branches at the end of winter, and limit the number of ramifications, keeping only the most vertical branches. Cut the twigs that come back inwards and those that shave the ground outward.